Inspired by the colour, texture and shapes of our beaches and shores. Each piece has a natural, timeless feel. Dramatic mountain peaks and the rich changing colours of the Isle of Arran provide the inspiration for this range of furniture. Flexibility of design, quality craftsmanship and attention to detail define a Fairlie Furniture kitchen. We undertake wide and varied furniture commissions for both domestic customers and businesses. 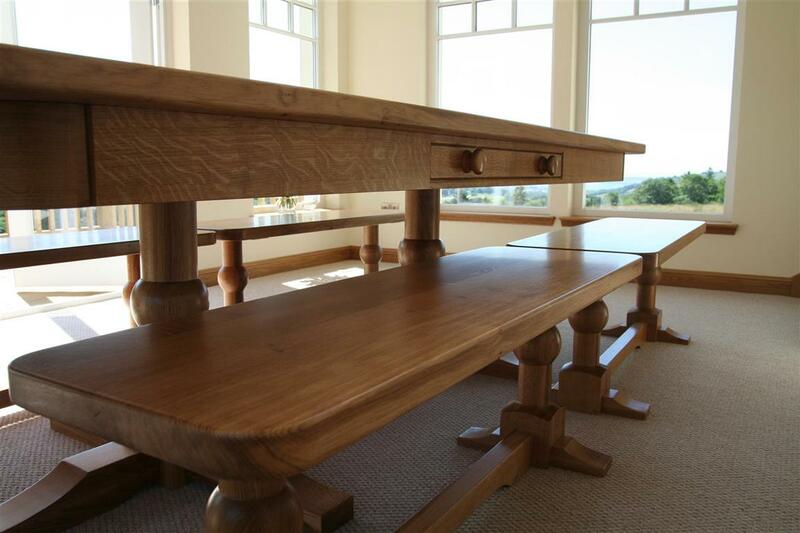 A colossal custom oak dining table which was built to order for a lovely young couple in Largs who were moving into their newly built house (presumably with a view to either having a very large family or throwing a lot of big dinner parties). It was a ten seater, with built in cutlery drawers. It was built to very specific dimensions and positioned in a dining room which had windows on all sides and a great view right out over the Firth of Clyde. Lovely. 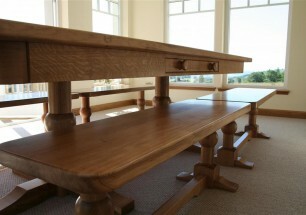 The table came with four benches and two handmade oak chairs for a head and the foot of the table. The photos below do it a degree of justice but in truth even the wide angled lense on the camera was struggling a bit with this table, it was so big.